This article explains how to create dialogs and modal windows in a WPF application that uses dependency injection. We will use services and factories to abstract the creation of windows and MessageBoxes. We will also see how to write unit tests for MVVM navigation. This is the second part of the article, if you are interested in the first part, you can find it here. We don’t want to create a View from the ViewModel, because it can’t be tested. So we have to abstract the view somehow. We can’t get the ViewModel directly from the container, because it can’t create the window. So we need something that creates the View for us. We can’t register the View in the container, because once we close the view we cannot recreate it without resolving it. In this case we use the Factory pattern, which consists in a class that will create the dialog for us. The factory class will be injected with the ViewModel. We also create an interface on the View, to abstract it. We want to display the dialog on the FirstViewModel, so we create a button, a command and we add the factory in the parameters of the constructor. When we have to close the dialog we face another problem, because the ViewModel is not aware of the view and cannot close it. We can use the button click event, access to the DataContext, invoke the command and then return the dialog result. 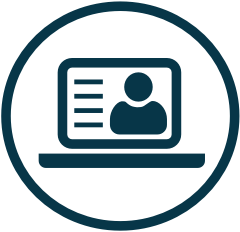 Bind to a command and create an event when the command is executed. From the view you subscribe to the “CommandExecutedEvent” and then you return the Dialog Result. Because we are subscribing to a singleton viewModel, we must unsubscribe from the event when we close the window, otherwise we will cause a memory leak. 1)	We need to create an “observable command” class, so we inherit from RelayCommand and we override the Executed method to fire an event when the command has been executed. 4)	In the code behind, we subscribe to CommandExecuted event and we return the dialog result in the callback. Then we override the OnClosing method to unsubscribe from CommandExecuted. The unsubscription is really important, because the ViewModel is a singleton and the Window will not be released by the Garbage Collector, because it holds a strong reference to the ViewModel. This will cause a memory leak every time we open the dialog. 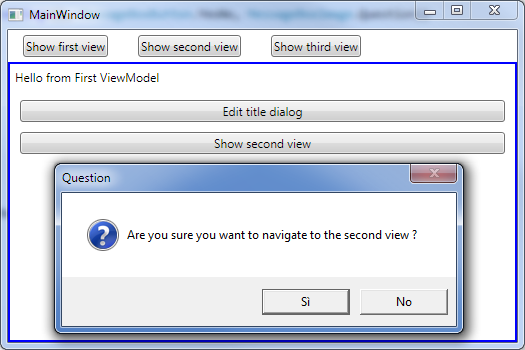 When using MVVM pattern it is common to use MessageBox and system dialogs from the ViewModel. The problem of this approach is that it breaks the testability of the method. If you want to write a unit test that verifies that the page changes when the user clicks yes, you have to actually click on the MessageBox. To solve this problem we abstract the MessageBox by creating a service that shows the MessageBoxs, and at runtime we inject the MessageBox, when testing we will use a Mock. Notice that MVVM frameworks usually contain all this services, so you don’t have to create them from scratch. An important part of development is to write unit tests for the application, to verify that the software responds correctly to the user interaction. 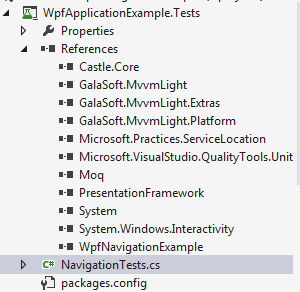 For this example we will use MsTests, for the simple reason that they are already installed in Visual Studio. In my daily programming I use NUnit framework. To make things work properly we need also to add some references. From NuGet we install MVVM Light libraries only and Moq. Then we add a reference to our application (Add reference -> Solution -> Projects-> put a check on the application. For the first test, we test that the hierarchical navigation works as expected. We verify that if we click a navigation button the view changes correspondingly. The second test verifies that the second and the third viewmodel navigations work as expected. For the second test we verify that a MessageBox is displayed when we click on the button “Navigate to second view”. If we click Yes on the MessageBox it should navigate, if we click No the navigation will not happen. For this case we have to provide an implementation of the IMessageBoxService that returns No the first time, and Yes the second. We will use Moq for this. And here is the complete test: first the user clicks on Navigate and clicks on No, then the user clicks on Navigate and click on Yes. The fourth test verifies that if we click on the “Edit title dialog” and we enter a title and we press okay, the FirstViewModel title will change. This test is different from the previous one, because instead of a system dialog we have our own dialog that we have to mock, and we have also a factory. This means we have to create 2 mocks to test the interaction between the dialog and the viewmodel, one for the dialog and one for the factory. The second step is to mock the factory. The Create() method must return the dialog that we mocked. The last test verifies that if we click on cancel, the title of the FirstViewModel doesn’t change. The sample application, including the source code, can be downloaded on my GitHub repository. I just wanted to say, thanks so much for this. Your blog is a fantastic resource, as I’m currently working with C#, WPF, interfacing to a PLC over Modbus… And this article is so timely for me, exactly what I’ve been looking for! I’m glad that you liked it. Soon I will do also a video on these 2 articles. Good luck with your project ! I’m not sure I like how each page must be passed when creating MainWindowViewModel though.. If you want to set the ViewModel in the ContentView and template it, you need the instance of the VM in MainWindow. You can write your own NavigationService, which takes ownership of that ContentView somehow, but that wasn’t the point of the article. Right now I prefer to use PRISM navigation, which takes another direction because it resolves ViewModels by reflection and uses strings for the navigation. It’s waaaay easier that this solution, you don’t need datatemplating, you have all the attached properties that you need to support regions and it has a full blown navigation stack.